Liddy Walsh was a friend of Mary Winchester who was visited by Azazel in 1973. He intended to make a deal with her to save her husband's life in exchange for permission to enter her house in 10 years. John's journal entry on Liddy Walsh. When Dean shows Samuel his father's journal, they discover that Azazel will visit Liddy Walsh the following night. When Mary finds out about this, she and Samuel head over to her house to help her. Azazel, under the guise of Dr. Brown, is in the middle of making a deal with Liddy to save her husband, who is dying of liver and lung cancer. He is interrupted by Samuel who shoots him with buckshot. Liddy watches as Samuel, Mary, and Dean battle against Azazel, who manages to escape. 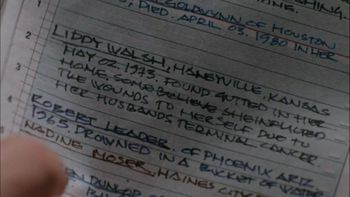 John's journal entry says that Liddy Walsh died of suicide on May 2, 1973. Since Azazel told Dean that he was going to "cover his tracks good," it was most likely done by Azazel's hands. This page was last edited on 25 February 2019, at 22:33.